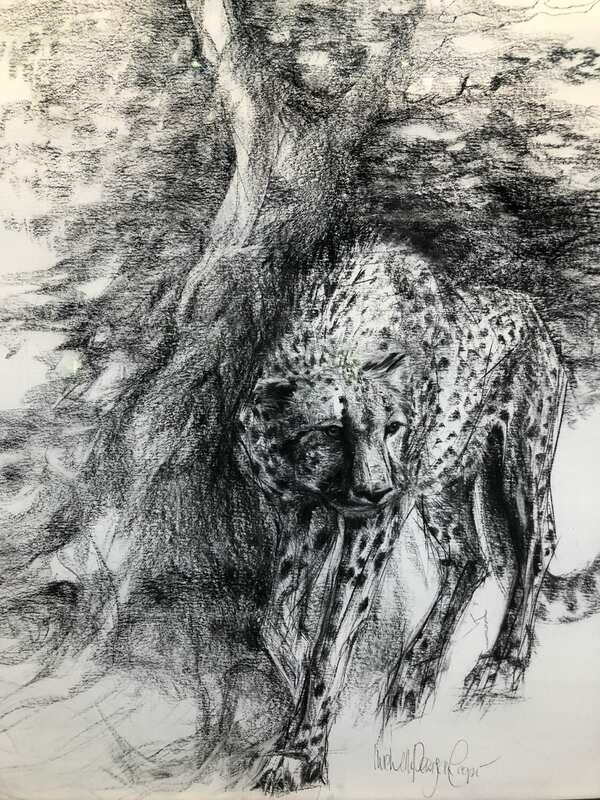 Between 26th October 2018 and 24th January 2019 a raffle is being held at Green and Stone for Michelle Pearson Cooper’s exquisite charcoal drawing ‘Cheetah’. This piece, measuring 4ft x 5ft and mounted in a handmade frame from Green and Stone, is available to win through purchase of a raffle ticket. Each ticket costs £25 and 50% of the money raised will go to the Artist Benevolent Fund. To buy a ticket you can either purchase a ticket in person at the shop, or over the phone, or via email. The winner will be announced on the 24th January 2019. Michelle Pearson Cooper studied art on a rarely awarded Art Scholarship at Millfield and in Florence under Signorina Simi who lists Annigoni as one of her pupils. Michelle has held 17 solo exhibitions in London, Palm Beach, Marrakech and Dubai, and collectors of her work include HRH The King of Bahrain, Bruce Oldfield, Prince Sadruddin Aga Khan, Mahdi Al Tajir and Tom Stoppard. Inspired by primeval landscapes and their wild creatures, on travels to India, Africa, Oman and the UAE, Michelle has given substance to her ideas born in the silence of the desert and the solitude of the wilderness. She chooses subjects that are powerful and challenging but always her affinity with them is paramount. Her honest approach and distinctive draftmanship is apparent in each faithfully executed drawing, achieving greater perception into their individual characteristics.